If it heads back to the west it will likely be a tropical cyclone and it could once again become a hurricane. Of course, that has to do with if it is picked up or is allowed to get under the ridge. Worth noting several models now hit Maderia so they may.well requires an tropical storm warning at least down the line. So is it possible this system could be around until November. Has a system ever lasted over 30 days???? This system is just crazy enough that it might decide to pick up Nadine on its way back West and head on to the Caribbean and then to the US. Blinhart wrote: Has a system ever lasted over 30 days???? 27 days is the record. 20 days would get her into the top 10. 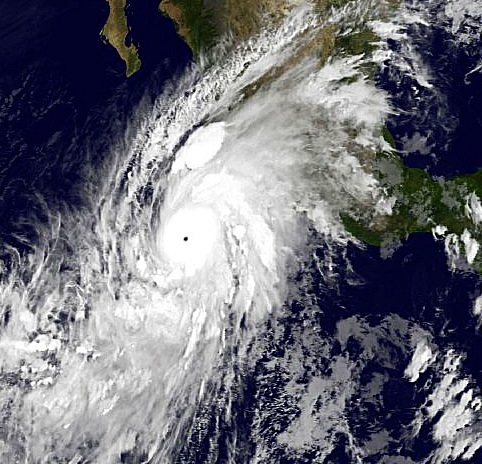 Today is Leslie's 19th day, and the forecast goes out to day 24 at least. 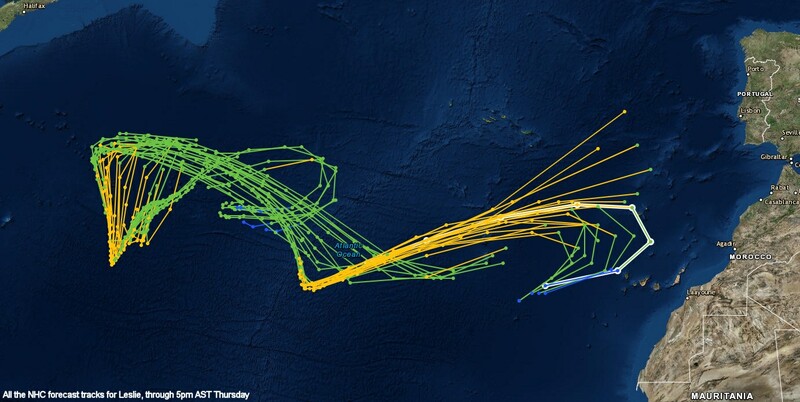 At this point it seems mostly to be a matter of whether it dies out off of the coast of Africa. If it survives that, I expect it will track westward for long enough to break the Atlantic record. But right now both GFSs and the Euro operational have it spinning down off of Morocco., Seems like to survive it probably needed to turn a little sooner. I believe it is the first time a tropical alert has been needed for Madeira? ...TROPICAL STORM WARNING ISSUED FOR MADEIRA ISLAND DUE TO LESLIE..."
So if this does become post-tropical again, would it have a chance to transition back into a tropical system yet again taking that path? What are models indicating? 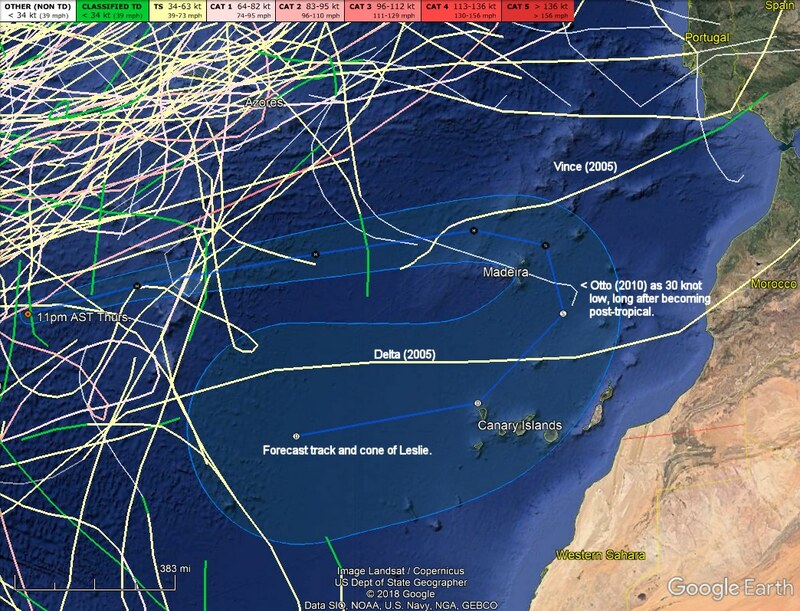 Delta 2005 significantly affected the Canary Islands during extratropical transition, but had no impacts on Madeira. Leslie will be the first ever TC hit for them in this record-breaking season. bob rulz wrote: So if this does become post-tropical again, would it have a chance to transition back into a tropical system yet again taking that path? What are models indicating? Not likely since it's going too far east. If it makes the turn before 25W then there could be a chance. Colored lines show the wind speed. Even extratropical storms will be colored as either a TS or hurricane. 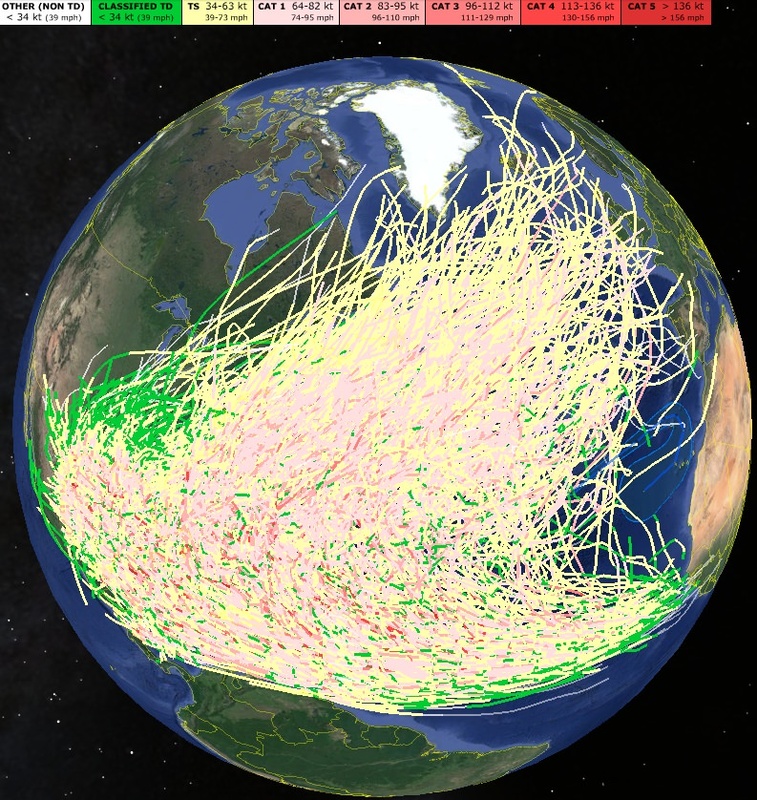 If an extratropical storm is less than tropical storm force, then it appears as white. 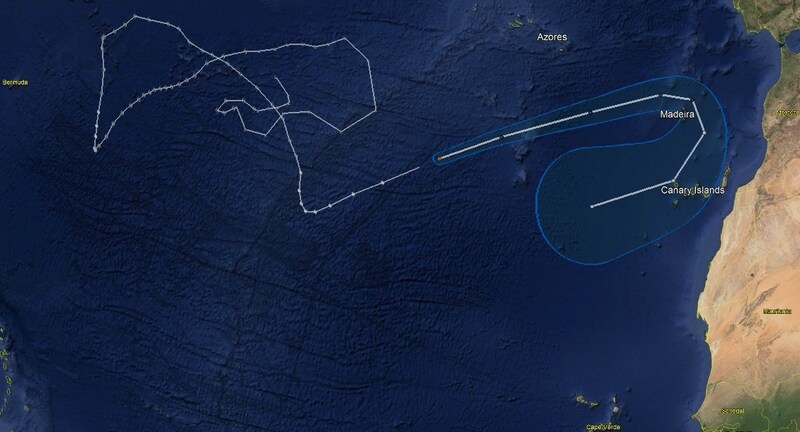 Leslie forecast track included. The 5pm AST Thursday NHC advisory is highlighted. The 11pm advisory, the 63rd forecast track, is not included. Just wanted to show how long the NHC has been at it. Longer actually, because there was the period when it was extratropical. Yeesh, it could practically shoot the Straight of Gibraltar and reform into a Medicane. That would be a fitting finale. services for more information on these hazards. 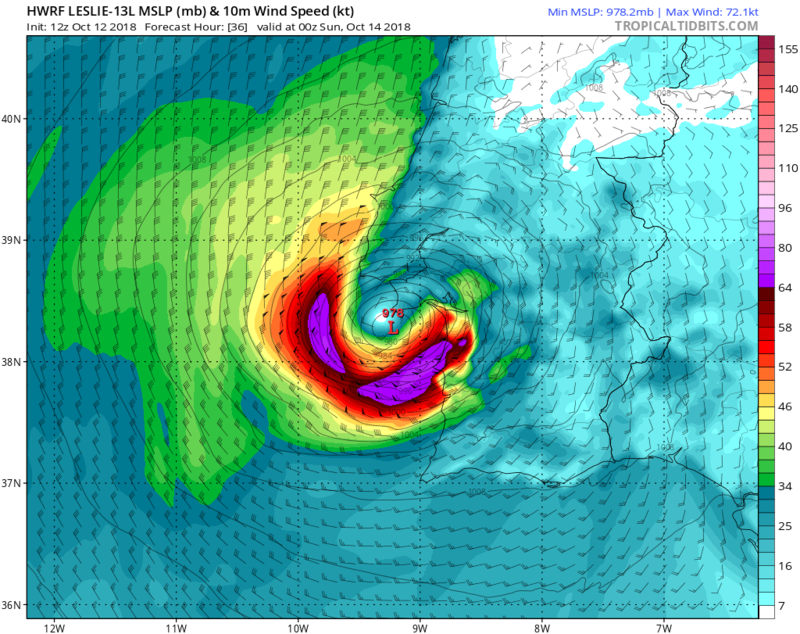 On both GFS and HWRF it doesn't look like Leslie is post-tropical by the time it reaches Portugal and Spain. I'm not sleeping, I'm waiting for the 0900 UTC advisory!